Energy and financial companies led a broad tumble for U.S. stocks in afternoon trading Friday as the slump in the price of oil deepened, pulling crude below $30 a barrel. The Dow Jones industrial average closed the day nearly 400 points down amid the market's worst first two weeks of a year ever. KEEPING SCORE: The Dow Jones industrial average slid 456 points, or 2.8 percent, to 15,922 as of 1:01 p.m. Eastern Time. 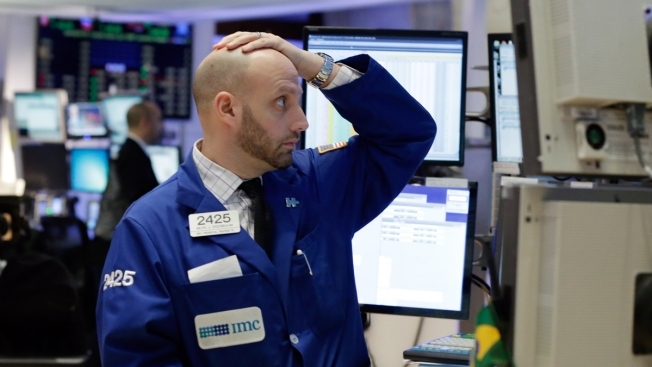 The Standard & Poor's 500 index fell 56 points, or 3 percent, to 1,865. The Nasdaq composite dropped 162 points, or 3.5 percent, to 4,452. The Dow and S&P 500 have now fallen nearly 9 percent this year, while the Nasdaq is off 11 percent. THE QUOTE: "Oil is the root cause of today," said Dan Farley, regional investment strategist at the Private Client Reserve at U.S. Bank. "People are uncertain, and when they're uncertain they're scared." VOLATILE MARKET: Stocks were coming off a broad rally on Thursday that gave the S&P 500 index its biggest gain since early December. That gain was a reversal from a day earlier, when the market turned in its worst day since September. Behind the market swings are growing investor jitters about the slowdown in China's massive economy, plunging oil prices and the implications those trends may have for U.S. corporations. OIL PRICES: The price of crude oil fell to the lowest level since 2003. Benchmark U.S. crude fell $1.91, or 6.1 percent, to $29.29 a barrel in New York. Brent crude, a benchmark for international oils, fell $1.72, or 5.6 percent, to $29.16 a barrel in London. The steep slump in crude from over $100 a barrel in the summer of 2014 has eviscerated energy company profits and made it much harder for them to pay off their debts. SECTOR VIEW: The 10 sectors in the S&P 500 index moved sharply lower. Energy and financials stocks were down the most, about 4 percent. TIED TO OIL: Several oil, gas and mining companies were down sharply along with oil prices. Marathon Oil slid $1.16, or 12.79 percent, to $7.91. Chesapeake Energy fell 37 cents, or about 9.8 percent, to $3.35. Consol Energy lost 53 cents, or 9.4 percent, to $5.09. Chevron shed $3.13, or 3.7 percent, to $82.34. COMPUTER PROBLEMS: Intel dropped 9 percent after the chipmaker posted its fourth-quarter results, noting its personal computer business continues to slump. The stock was the biggest decliner in the Dow. It fell $2.95 to $29.78. ROUGH QUARTER: BlackRock dropped 5.4 percent after the investment firm's fourth-quarter profit fell short of Wall Street forecasts. The stock lost $16.85 to $293.15. VEGAS, BABY: Wynn Resorts jumped 9.1 percent after the casino operator said it expects to report a larger operating profit from its Las Vegas business. The stock climbed $4.70 to $56.20. DISCOURAGING DATA: The Federal Reserve said U.S. industrial production, which includes manufacturing, mining and utilities, dropped in December for the third month in a row. A separate report from the Commerce Department indicated U.S. retail sales dipped last month. Meanwhile, a measure of inflation before it reaches consumers declined in December. EUROPE: Stocks opened higher in Europe but quickly fell. Germany's DAX lost 2.5 percent, while France's CAC 40 dropped 2.4 percent. Britain's FTSE 100 dropped 1.9 percent. ASIA'S DAY: In China, the Shanghai Composite Index finished down 3.6 percent, sliding to its lowest close since Dec. 8, 2014. China's official Xinhua News Agency reported that banks' new loans during the last month fell over a year earlier, in a sign that momentum for the credit that fuels economic growth was slowing. Hong Kong's Hang Seng dropped 1.5 percent. Japan's Nikkei 225 lost 0.5 percent and South Korea's Kospi slid 1.1 percent. BONDS AND CURRENCIES: Bond prices rose. The yield on the 10-year Treasury note fell to 2.03 percent from 2.09 percent late Thursday. The euro rose to $1.0955 from $1.0862, while the dollar fell to 116.77 yen from 118.15 yen.